Is it an Apple? Is it an iPhone? No, it's the HTC One A9! HTC's latest premium smartphone has touched down with an attractive, if not entirely unfamiliar design. The all-metal One A9 is here, and it's not replacing the One M9. Instead it's tasked with complementing the firm's flagship brand with a new sultry design and slightly lower price tag. You also get a 5-inch full HD display, octa-core Snapdragon 617 processor, 2GB of RAM, 16GB of storage, a microSD slot, 13MP rear camera and an Ultrapixel selfie snapper. A neat feature HTC has also included here is a finger print scanner below the screen, allowing you to unlock the handset with a digit. That does mean there's some extra bezel action going on, and the fact it doubles as a home key may confuse some with the on-screen navigation keys just above it. HTC has also done some work in the camera department, even though it's dropped the megapixel count down. The One A9 boasts OIS (optical image stabilisation), RAW format capture and processing, a simplified camera app interface and a new hyperlapse video mode. 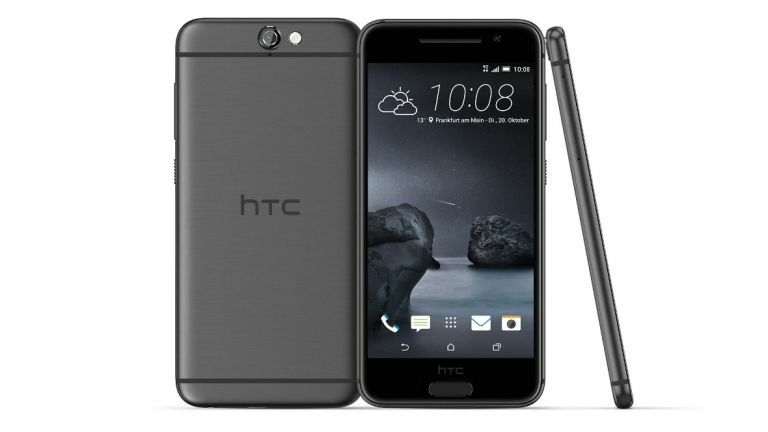 The HTC One A9 will go on sale at the beginning of the November and will be available in Carbon Grey, Opal Silver and Topaz Gold. If you fancy a more flamboyant colour, these will be followed by Deep Garnet (that's red to us) at a later date. In terms of an One A9 price you'll be able to pick it up SIM free for £429.99, which is less than the One M9's launch cost, but the M9's price has dropped since then and you can now pick it up for less than the A9.